How can a bee hate Christmas? A highly addictive series of games for iOS. Why would a bee hate butterflies? 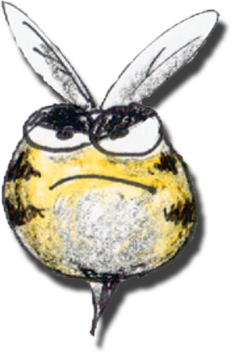 Maybe it's an argument over pollen, maybe the bee is just angry. Crash your way through four worlds by tilting and tapping your iOS device to crush obstacles and evil butterfles that flutter through space, field, desert, and water levels. He wanted pollen for Christmas and got a red sweater instead. Buzz through 5 levels tilting and tapping your iOS device to take your revenge on Christmas. Shatter candy canes, flying presents, snowballs and even Santa's sleigh. Vincent Van Gogh produced over 2,100 artworks many of which were still lifes of flowers and not a single bee in any of them! Go on a rampage and kill objects associated with Vincent Van Gogh while flying through backgrounds of his paintings. *WARNING: Contains educational content and may lead to an increased awareness of Vincent Van Gogh artwork.